Our main research fields are transportation planning, traffic engineering, infrastructure engineering, urban planning, environmental engineering and ITS (Intelligent Transport Systems) technology. These fields are thoroughly integrated to support the development of advanced technology in response to social issues and anticipated future needs. We believe that a comprehensive approach – based on transportation technology, civil engineering, and social science – are necessary to cope not only with increased demands on social welfare, but also with multi-faceted infrastructure development and environmental problems. The Graduate program of Transportation Engineering and Socio-Technology aims to develop engineers and researchers who have comprehensive and expert knowledge of transportation and infrastructure engineering, and will contribute to maintain a sustainable community. The students will be trained to find creative and workable solutions to complex problems when designing cities, transportation systems and facilities. Our program was founded in 1979 when it was divided from the Civil Engineering program upon the establishment of five new courses in the Graduate School of Science and Technology. 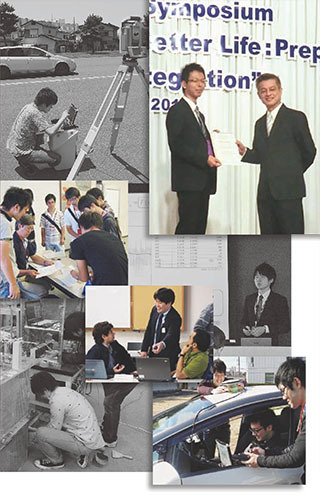 This major is a unique academic program on comprehensive transportation engineering, including planning, designing, construction, maintenance, and management of transportation facilities in Japan. The Master’s degree is designed for advanced engineers to study sophisticated transportation and infrastructure technology. The Doctoral degree is designed for transportation specialists to enhance their research skills and communication abilities working as professional researchers. Graduates are now working as public officials, traffic engineers, consulting engineers, construction engineers, and logistics managers in the fields of transportation engineering, not only in Japan but also all over the world.